S.K.SAINI: Arnold Schwarzenegger: My Experience in Seeing My Inspirational Hero and Favourite Actor. 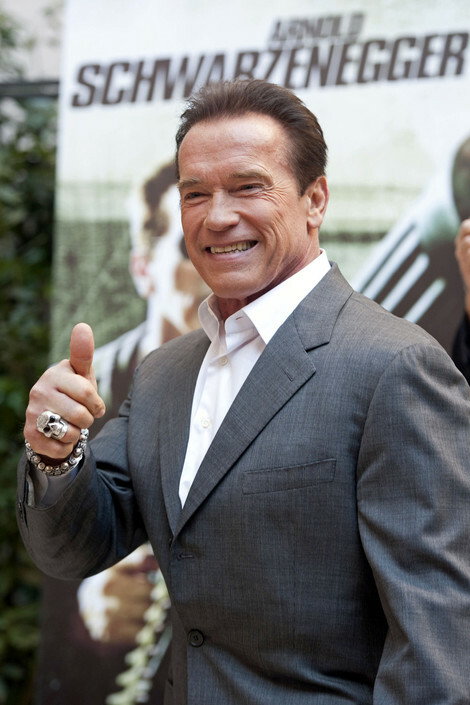 Arnold Schwarzenegger: My Experience in Seeing My Inspirational Hero and Favourite Actor. There comes a moment in every person’s life, when they finally see that one thing which they've wanted to see their whole lives. I got to have such an experience on the 14th of June, 2013, when Arnold Schwarzenegger came down to Melbourne, Australia to give a speech on how he gains inspiration and motivation to complete his goals in life. 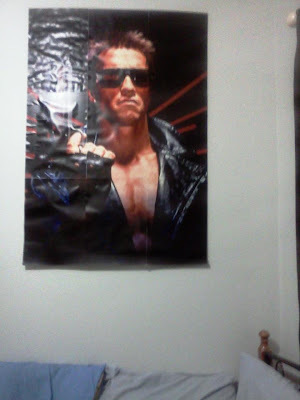 I am a massive Arnold fan. I really mean it; I've literally been a fan of his for as long as I can remember. I can recall when I was very young, my parents watched Terminator 2: Judgement Day. I absolutely loved it! I've been a fan of his ever since and watched everything he has been in. As I grew up with his movies, I realised how he came to be in America from Austria. He completed all of his goals by working hard and this is one of the reasons why he’s a major influence and inspiration to me. 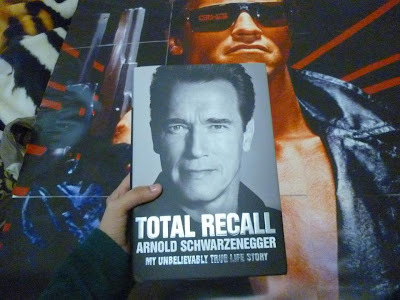 I'm such a big fan that I own all of his movies, right down to owning a massive Terminator canvas in my room and his autobiographical book, Total Recall: My Unbelievably True Life Story. I bought the tickets for the Summit early, two-for-one general tickets for $121. I couldn't believe it; I couldn't believe that my inspirational and favourite hero was coming down to Australia. The best thing about purchasing these tickets was that they were worth about $700+ and I counted my lucky stars by getting it early. After a few weeks of waiting and waiting, the tickets finally arrived at my doorstep. Even when I held the tickets in my hands, I just wanted that day to come faster. Of course when you’re looking forward to something, the days purposely go slower as to antagonise you further and send you down into an impatient fit of emotions. Okay, I wasn't THAT bad, maybe just a little. Later on in the weeks, I got two free VIP tickets from the Summit. I took it straight away and tried to sell the previous tickets which I bought. It was a massive fail. A few people opted to buy them, but they either backed out the last second or they never replied back. That was fine with me; I’ve now kept the tickets inside my memory box, which I will treasure forever. The 14th of June finally came and I literally couldn't sleep the entire night because I was so excited. Woke up early to finally receive my Samsung Galaxy 4 and spent those hours figuring out the tricks and awesome applications that came with it. I got dressed, scratched myself by accident near my lip (worst look ever) and finally departed on the 5:37pm train with my Mum to Southern Cross Station. Round about 6:10pm, we reached Southern Cross and took Tram number 96 to Crown Casino which is literally next door to the Exhibition Centre. We had a yummy margarita, had dinner downstairs (chicken rice!) and at 8:00pm, we finally walked down to the Exhibition Centre where we got our wristbands to get inside. As we walked inside the room, I didn't realise how massive it was going to be. It was like I walked inside a massive theatre, filled with more than a few hundred chairs all seated in different rows. They all faced the stage which was huge (in my opinion, because I rarely go to these kinds of things), there was a thick dark blue curtain which draped the entire back stage and at the top held three wide screens; the largest in the middle with the two smaller ones at the sides so people who were unfortunate to be at the very front could view them just in case. To our disappointment, the seats at the front of the stage were already occupied; instead we took to the side of the room near the front, where we could still see the stage quite clearly in view. We finally sat down and made ourselves nice and comfortable. As we looked to the stage, Jamie McIntyre stood at one of the podiums looking out to the audience with a big grin on his face. I quickly rummaged through my bag as fast as I could and grabbed my brand new Samsung Galaxy 4, eager to try out its amazing 13mp camera. As I started filming, Jamie spoke about Arnold’s meeting with Julia Gillard. “Arnie got to meet our beloved Prime Minister yesterday…” The audience laughed and a male’s voice yelled out, “Why? !” Jamie chuckled along with the spectators and continued his speech. “So I pulled Arnold aside and I said, ‘Arnie, I want you to meet the Prime Minister on one condition. That you TERMINATE her!’” The crowd erupted with laughter (me included) and a lot of the audience members whistled and cheered at Jamie. Afterwards, he spoke a bit more about Arnold’s body-building career and played an epic introduction video about Arnold Schwarzenegger’s life. My stomach at this time felt so heavy, that the feeling of excitement was building up to the point that I would've cried with happiness, as I knew that Arnold would be coming. When the video ended, Jamie turned to the audience again and smiled. There was silence throughout the room and I could literally hear everybody stop breathing. Oh, that waiting! It was killing me inside. We, the audience, cheered and screamed even louder as we finally saw Arnold emerge like a ghost from behind the blue curtain at the side of the stage. He was wearing his formal grey suit and he smiled widely at the cheering audience while waving and nodding his head. Bonnie Tyler’s song, ‘I Need a Hero’ played in the background as his introduction music (though I would have much preferred Brad Fiedel’s The Terminator theme). I was still filming at the time and could literally feel tears stream down my face. It might sound like an over-exaggeration, but as I said before, it’s not every day that you finally get to see your most favourite actor and inspirational hero in person. As my hero finally reached the podium, the music died down but the audience continued to cheer. The air was full of energy and you could feel the positiveness sweeping through the air. “You can sit down and relax…” said Arnold with his trademark Austrian accent into the microphone, with a grinning smile etched onto his face. We all chuckled and sat back onto our seats, still cheering and eagerly awaiting the words that would come out of his mouth. I couldn't stop the fan-giggling. I was in the moment and right then I remembered the fantasies of my reaction if I were to ever see Arnold in person. Let’s just say I wasn't calm and collected as I was in my head. The audience took their time to stop cheering and Arnold waited patiently as he peered at us all, obviously pleased with our reactions to his legendary presence. Arnold thanked the guys that made the introductory video and started off his speech about his happiness at being in Australia again. For those who don’t know, Arnold had come down to Australia before in 1980, where he won his 7th Mr Olympia contest at the Sydney Opera House. “People always asked me, what is the secret to success? And I always tell them, is it the short version or the long version? The short version is very simple. You gotta have a 22 inch bicep.” The audience and I burst out laughing while Arnold smiled cheekily at the audience. He continued, “The second, you gotta be able to kill Predators with your bare hands. The third, you have to be able to travel back in time, travel back in time and save the human race and number four, you got to have this charming Austrian accent.” My cheek muscles were killing me from laughing so much. Oh, I love it whenever he references my favourite movies. After that, he went on to talk to us about the long version of his tips on success. 1. Have a Vision – In order to succeed in life, you must set your goals and put forth that stepping stone, imagining where in the future you see yourself and how you want to get there. Unrelated to us Australians, but related to our daily lives, Arnold spoke about how 74% of Americans felt unfulfilled and lack of purpose in their lives which prompted them to constantly change jobs. He mentioned how his goals in his life set forth the journey of him leaving Austria and going to America to become one of the world’s most famous body-builder action star and politician. This made me think of myself. I want to be an author and popular writer one day. I've had this vision since I was a little girl and it has stuck with me ever since. After graduating high school in 2008, studying a variety of different courses, I finally ended up at University where I'm currently studying the Bachelor of Creative Arts. This is my major stepping stone in getting to where I want to be. “To crush your enemies, see them driven before you, and to hear the lamentation of their women.” Delivering his famous line like he did in Conan the Barbarian sent the crowd into cheers and applause. Arnold chuckled with the obvious delight showing on his face. I really loved this introduction. He spoke truth that only so many of us have felt in our lives. For example, it took me 5 years to get to my dream course at University because I was afraid of failing. But like Arnold said, “You can only fall to the ground and pick yourself up.” He also stated that you are not a failure if you pick yourself up, but you are when you stay on the ground. Arnold’s experience in his speech and public knowledge of his life, he dreamt big. He had an end goal, shot to the stars and became Governor of California. 3. Ignore the Naysayers – “It is natural that when you have a big vision, with big dreams, with big goals that people will say to you all the time this can’t be done. It’s impossible. No.” This is something to learn from everyone. Don’t let people be your obstacle from being successful in life. It’s not their life, it’s yours. Arnold said that he ‘didn't like negativity’ and in personal experiences, he spoke about the many times he was dissuaded when speaking of his visions. In short, it was related to his visions in body-building becoming a Hollywood action star and becoming Governor of California. He said that if he listened to these people from the start at 15 years old, he wouldn't be where he is now and probably be yodelling in the hills of Austria with a career as a ski-champion. All his best quotes are in this step. For this, you have to watch the footage I took of Arnold so you can hear them for yourself. 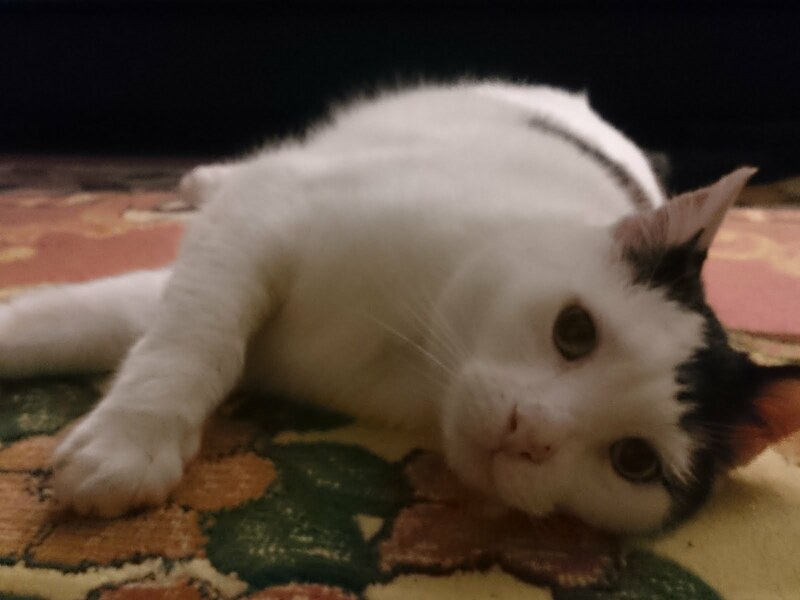 I admit that a trip of guilt was suddenly upon me. I can’t live on 6 hours of sleep; I normally get at least 10-12 hours, which is basically half a day in a way. Wow, that’s a lot of time wastage. 5. Give back to the Community – (Unfortunately and quite sadly, my fingers pressed a button and stopped recording. So I was like a fool, holding my camera up and it wasn't functioning the way that it was meant to). In the short version however, Arnie gave back by stepping away from movies (where he made millions of dollars for each movie) and became a public servant (Governor) with a low fixed income. Giving back to the community made him feel good, with this involvement, he considered that giving back to the country that helped him make money and become famous was the greatest job. I quickly pressed the record button again where some members of the audience got to ask questions to Arnold. Both sides of the room (a bundle of about 20 or so people from each side) rushed down near the stage, but only 4-5 people were the lucky ones chosen to ask their question to their hero. I didn't go down because all my questions that I had in my head had been answered; there was no point in going down there and making a fool of myself (especially since only a few were chosen). One of the questions asked what his favourite film quotes were. In a quick response and delivering his line like he did as Dutch in Predator, he yelled, “GET TO DA CHOPPA!” He chuckled along with the audience. “I mean where do you start with that? ‘You shouldn't drink or bake’? Or when I went to stab the guy in the chest and say ‘stick around’? Or, ‘I’ll be back!’, ‘Hasta la vista, baby!’ If it bleeds, we can kill it!” All of us, including Arnie had such a good laugh, the look on his face and how proud he was made me even happier. He spoke of his astonishment that so many of his films had globally famous lines. He felt that fans who watched his films would walk out of the cinemas with two of the best lines of the movie and make it famous. In a piece of trivia which I already knew from previous interviews, Arnold spoke about The Terminator and how he wanted to change the most famous line from ‘I’ll be back’ to ‘I will be back’. Due to James Cameron putting his foot down (luckily he’s a perfectionist) and the banter of arguments that ensued, Arnold went ahead and delivered one of the most famous lines in movie history. He also spoke about how he gets distracted too easily and mentioned how women (particularly in reference to his wife Maria) were better at multi-tasking than men. He also mentioned that he owns a M47 Patton Tank (I already knew this, but it was awesome to hear his enjoyment in speaking about it). I mean who else would own a tank? Arnold Schwarzenegger of course! In a bit of background history, Arnold has loved this tank since he was 18 years old and in the Austrian Army. He bought the tank in 1992 in Austria and shipped it over to America (with the Government’s permission, because let’s face it, he’s Arnold) where he rides it nearly every weekend and takes children who are in the after-school program for a ride. 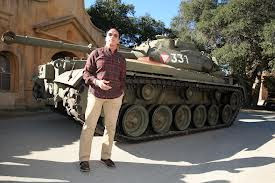 Can you seriously imagine Arnold just casually driving his tank around California? Oh, what an epic image and typical Arnie. I want to ride in your tank, Arnie! Jealous. Last but not least, he mentioned his future movies, lots more Terminator movies, Triplets (which is the sequel to Twins) and Conan. Overall, I had such an amazing time listening to his inspirations and even though I would have loved to have a conversation with him, it was still a dream come true to see my legendary actor and hero in person. 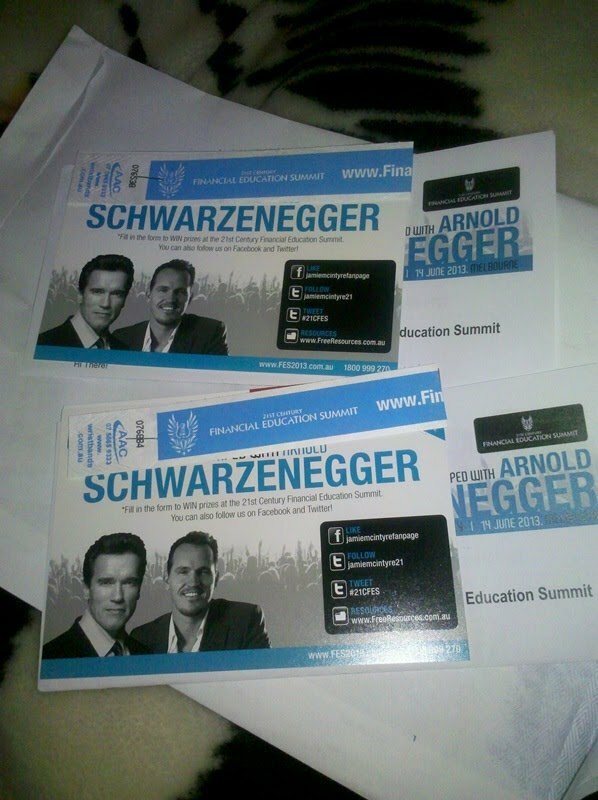 This Summit proved that my dedication to my dreams is all due to Arnold. His whole life in wanting to be the biggest and the greatest where he has achieved everything he can possibly do. When I finally publish my book, it’ll be dedicated to him as well as many others who have never stopped supporting me. For the complete footage I took of Arnold Schwarzenegger, I've put it on YouTube and linked it to my blog here. It's better if you watch it in HD and fullscreen. Do watch the footage; I've left out so many of the best parts that can only be known by watching the video. Enjoy and I hope that you’re inspired!